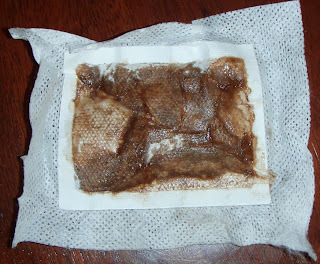 I have never been able to get my detox foot pads to come clean when putting them on my feet. So much goo comes out -- all other areas of my feet have come clean except the toes. This has been after wearing them for YEARS. Some reasons for this may be because of the metal fillings I had in my mouth, the root canals and even the metal implant I have in my mouth. I also have issues with TMJ and I have a small tumor in my brain. So this might be the reason why my toes are so badly filled with gunk every day. They are the reflexology point for my head. Here is a picture of my foot pads ON my toes, and another picture of my foot pads with a teeny white spot! It may not be a lot, but there IS a small white spot in the middle!!! 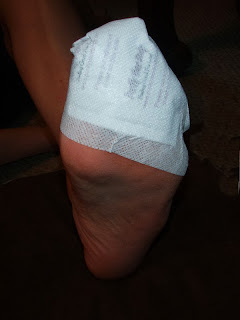 my toes are always the "gooiest"
To try a free sample of my detox foot patches for yourself, please visit my website (http://www.purifyyourbody.com) and fill out a "contact us" form with your mailing address. I will reply to you with a confirmation email telling you when I will send the samples out :) Thanks! Toxins are in your house! Zeolite -- Advanced TRS vs ZeoPure -- What is the best type of Zeolite? Do Detox Foot Pads Work? Can detox foot pads help you lose weight? (C) 2014. Purify Your Body, LLC. Simple theme. Powered by Blogger.